Gene engineering is the most powerful existing tool for life extension. Mutations in certain genes result in up to 10-fold increase in nematode lifespan and in up to 2-fold increase in a mouse life expectancy. Gene therapy represents a unique tool to transfer achievements of gene engineering into medicine. This approach has already been proven successful for treatment of numerous diseases, in particular those of genetic and multigenic nature. More than 2000 clinical trials have been launched to date. We propose developing a gene therapy that will radically extend lifespan. Genes that promote longevity of model animals will be used as therapeutic agents. We will manipulate not a single gene, but several aging mechanisms simultaneously. A combination of different approaches may lead to an additive or even a synergistic effect, resulting in a very long life expectancy. For this purpose, an animal will be affected by a set of genes that contribute to longevity. In addition, a gene therapy of all major age-related pathologies will be developed to improve the functioning of individual organs and tissues in old age. As a result, we will develop a comprehensive treatment that will not only dramatically extend lifespan, but will also prevent the decrepitude of the body. Experiments will be conducted in old mice. Thus, in case of success, the developed method of aging treatment can be quickly moved to clinical trials. 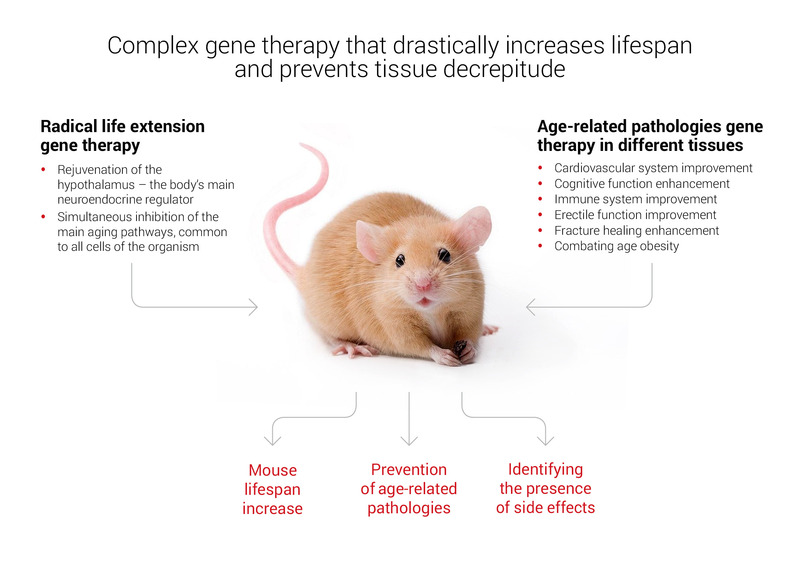 The goal of the project is to develop a complex gene therapy that will drastically increase mouse lifespan and prevent tissue pathology in old age, coupled with the safety assessment of the treatment.